Fans who showed up at the SAP Center in San Jose for Bellator 172 on Saturday night got a big knockout in the main event. But it wasn’t the one they were expecting. After the originally scheduled headliner of Fedor Emelianenko vs. Matt Mitrione was called off hours before the card due to a Mitrione case of kidney stones, the lightweight co-main event of Josh Thomson vs. Patricky Freire was bumped up to the main slot. And the Brazilian fighter nicknamed “Pitbull” ended the show with a flourish, using a big uppercut and a pair of hammerfists to finish the former Strikeforce lightweight champion. The time of the knockout was 40 seconds of the second round. Thomson, fighting in his hometown, was competing for the first time since 2015, and the ring rust showed in the opening round. Neither fighter was particularly active, but Freire dropped Thomson with a right to the temple late in the round. Early in the second, however, Thomson was dropped to the mat after an accidental headbutt as the two exchanged in close. Thomson got back to his feet and instinctually shot for a takedown, but Freire caught him with a right hand on his way in, putting an end to the fight. The victory was Freire’s seventh Bellator knockout, which ties him with Hector Lombard for second all-time in company history, one behind welterweight champion Douglas Lima. 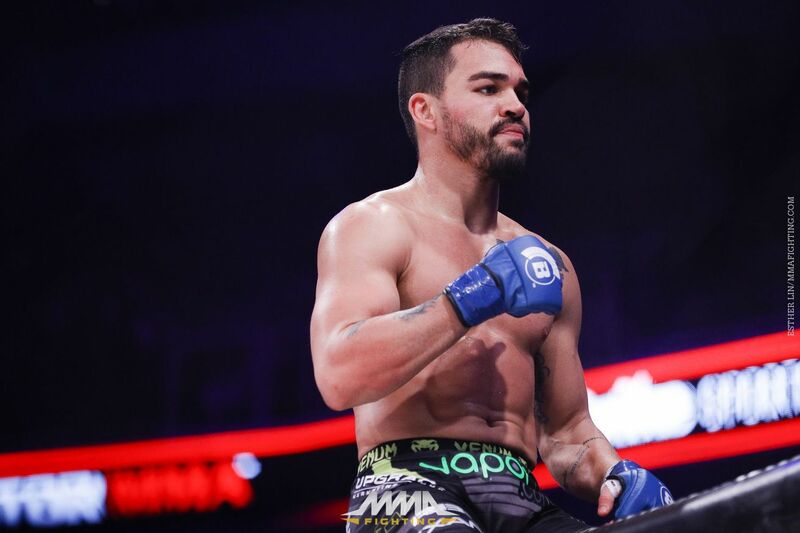 It was Freire’s third win in his past four fights, with the only loss in that span to current lightweight champ Michael Chandler. Thomson (22-9, 1 NC) had a two-fight win streak snapped. It was his first stoppage loss since a memorable head kick knockout defeat to Yves Edwards at UFC 49 in 2004. In the co-feature bout, veteran Cheick Kongo’s heavyweight matchup with Britain’s Oli Thompson had a familiar look. In a one-sided matchup, Kongo outgrappled Thompson, landed some brutal knees in the clinch, and worked Thompson over in top position. Since Thompson had little to offer in response except for his unquestionable toughness, the bout lacked excitement but went the distance. The judges scores were 30-26 and a pair of 30-25s in Kongo’s favor. Kongo improved to 26-10-2 with the victory, which is his fourth in a row, all of which have been decision wins. Thompson (17-10) has lost two in a row. Emelianenko did make an appearance before the crowd on Saturday as he cornered his teammate, middleweight Anatoly Tokov, who scored a second-round TKO victory over Francisco France in a 187-pound catchweight fight. France (13-5-1) actually got the better of things in the opening round, using slick transitions from an armbar to a a triangle and back to an armbar in one ground exchange. But things turned in the second round, starting with a bizarre exchange. With Tokov standing and France on his back, Tokov walked up to France and drilled him with a kick to the groin. After a timeout and restart, Tokov took over and finished the fight with a brutal ground-and-pound flurry. He landed one big right hand after another until referee Jason Herzog waved things off at 2:24. The 25-year old from Tobolsk, Russia improved to 25-3 with his 20th career stoppage win in his Bellator debut. A wild flyweight brawl between Veta Arteaga and Brooke Mayo came to an unsatisfying conclusion late in the third round. Arteaga clobbered Mayo with a huge overhand right, and soon thereafter, Mayo’s left eye was badly swollen. Mayo pleaded with the cageside doctor to let her finish the fight, but the doctor recommended the fight be stopped, so it went into the books as a TKO victory at 4:04 of the third round for Arteaga. What the bout lack in technique it made up with spirit, as the two tore into one another for the better part of three rounds, with Arteaga looking more impressive in the standup and Mayo on the ground. Arteaga improved to 3-1, 2-1 in Bellator, in a bout which was bumped up from the preliminary card after the main event dropped out. Mayo, who was 5-1 as an amateur, dropped her pro debut. In the main-card opener, Josh Koscheck’s Bellator debut turned out to be an evening to forget for the longtime veteran. Koscheck, who signed with Bellator back in June, 2015, lost in short order to Mauricio Alonso in a welterweight matchup. Alonso dropped Koscheck with a straight right to the face. Koscheck got back to his feet, but then was blasted with an uppercut to the jaw. Koscheck grabbed his eye as if he was poked, which he wasn’t, and Alonso poured it on until referee John McCarthy waved it off at the 4:44 mark of the opening round, giving Alonso the TKO victory. Alonso, a Curitiba, Brazil native who usually competes as a middleweight, improved to 13-7 (1 NC) with his third consecutive win, and gave was quite upbeat in his postfight interview. Koscheck, fighting for the first time since a March 21, 2015 loss to Erick Silva, dropped to 17-11. It was his sixth straight loss and his fifth via finish.